Last weekend, 20 members bused to Big Ridge Brewing Co. in Surrey. They met another 15 members there and imbibed cask-conditioned dry hopped porter and two different IPAs. This weekend, members and the public can gather at St. Augustine’s brew house and kitchen on Commercial Drive for CAMRA Vancouver’s Summer Beer Festival. Members pay $20 and non-members pay $25 for a tasting glass and three drink tokens. The summer-focused craft and cask-conditioned beers will include raspberry wheat ales brewed by Phillips and Granville Island brewing companies and an orange wheat ale from Squamish’s Howe Sound Brewery. Brewmaster and the R in R&B, Rick Dellow, says when he and his partner, Barry Benson, the B, started in the East Side Brewery Creek district in 1997, drinkers were hesitant to try strong, hoppy beers like R&B’s Hoppelganger IPA. Now it’s his company’s top selling bottle beer. With more brewers, brewpubs and groups like CAMRA Victoria and CAMRA B.C., which incorporated as a non-profit in 1990 to promote natural, crafted beers, beer drinkers’ tastes have changed, he said. Lundy Dale, founder and president of CAMRA Vancouver, likens the difference between a mass-produced beer like Kokanee and a locally brewed craft beer to the difference between fast food coffee and unadulterated espresso. Large mainstream breweries use lower grade barley, which contains more starches, and add cheaper corn, rice and preservatives, according to Dale, whereas breweries like her favoured Central City use pure malts, barley and wheat and filtered water. 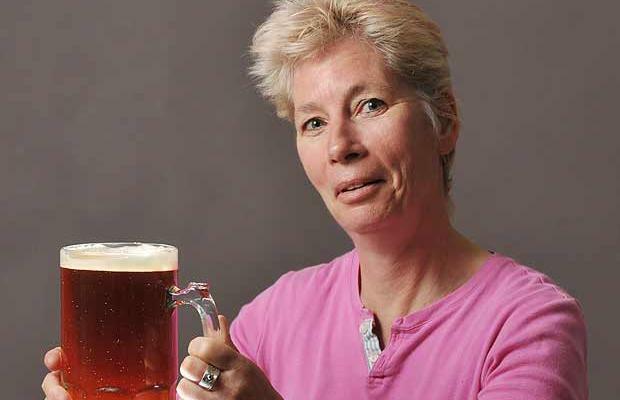 Cask-conditioned beer is conditioned or fermented in a cask, lending to a fuller-bodied beer, she said. British friends who belonged to CAMRA, started by angry beer drinkers in the U.K. in 1971 to combat the replacement of traditional regional beers with factory beers, turned Dale on to craft beer in 1999. She’s since become the senior beer adviser for Firefly Fine Wines and Ales on Cambie Street. In the beginning, CAMRA Vancouver members gathered once a month at the former Dix on Beatty Street. Now CAMRA members tap casks at several local establishments throughout the week. CAMRA Vancouver hosted its first Oktoberfest last year. This year’s event, Sept. 24 at Heritage Hall, will feature marzen, a traditional Oktoberfest beer, and sausages flavoured with brews from Central City. Dale says CAMRA Vancouver’s membership ranges in age from 25 to 50 with a balanced proportion of men and women. She describes it as less mainstream than Just Here for the Beer, which hosts an annual beer tasting event at the University of B.C. “We are a little bit geekier,” she said.